After a 1km warmup hill we will start to enjoy the tour that takes as allarround the valley. In the area of Plužna village we can visit the picturesque Virje waterfall and the karstic source of Glijun creek. This is one of the largest and most constant karst sources in the Soča valley. Springing from among the rocks in the bed of the Glijun, the water has an average temperature of 5.5 °C. We will ride pass the water reservoir/ lake where we will have a nice view on the valley and the Julian Alps. On the way we wil also see the bigest slovenian waterfall Boka. You can see it from the mail road or you can make a 10min hike in the forest till a view point. Nearby we will get another spectacular view on the valley, just before cross the Soča river. 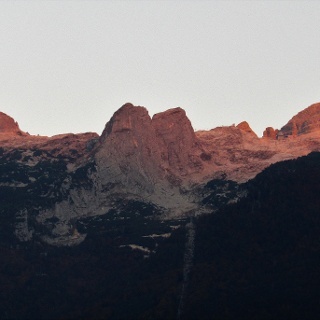 From the parking place you can spot in the background the highest slovenian mountain Triglav (2.864m). And riding along the Soča river, you will probably see some kayakers playing in the waves. 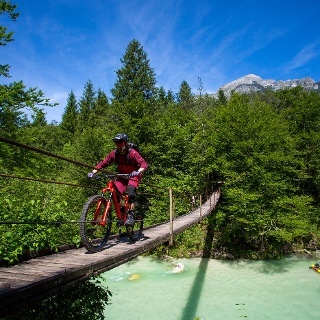 A special experience is the crossing of the Soča and Koritnica rivers along wooden hanging-bridges. Be carefull at the steep descet from the lake to the golf course - we suggest inexperienced bikers to walk. Cross the wodden hanging-bridges on foot. Between the two hanging bridges over Soča and Koritnica rivers the trail is exposed due to a smaller landslide. We can shorten the tour by goind from the Čezsoča village diectly to Bovec, but we skip the experience of crossing the wooden hanging-bridges. 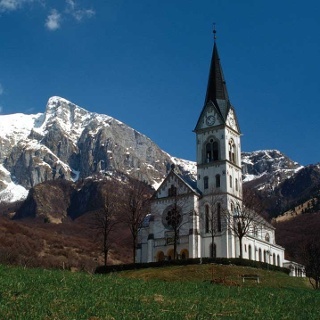 The tour starts in the centre of Bovec and continues via the main road toward the hamlet of Plužna. In the centre of the hamlet, by the fountain, turn right and cycle to the artificial lake made for the Plužna hydroelectric power plant. The tour continues along the lake and further following a concrete channel up to the first post, where a left turn must be made. Next is a short but rather demanding descent to a bridge over the Glijun Stream. Some 100 m after crossing the bridge is a junction; turn right here and continue across the bridge over Ročica and past the golf course to the main Bovec-Žaga road. Here, turn right again and follow the main road up to the branch-off for Čezsoča. The main road is left here to cross a bridge over the Soča River. 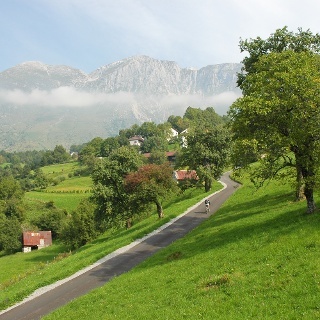 On the other side of the bridge, turn left to a macadam road and follow it to the village of Čezsoča. The tour continues via an asphalt road straight through the village to the intersection for the hamlet of Jablenca, a bit before ‘gostilna Vančar’ (i.e. the Vančar guest-house). At the intersection, continue straight, and after 3 km of asphalt road the hamlet of Jablenca is reached. Soon after the hamlet, a footpath branches off left to a wooden bridge over the Soča River. After crossing the bridge, the tour leads left and continues to a wooden bridge over the Koritnica River. 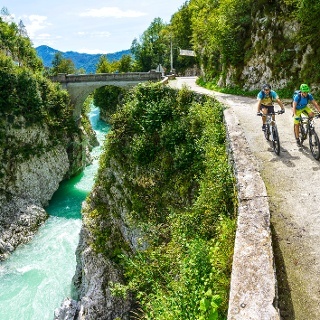 After crossing that bridge, an asphalt road toward Bovec is reached at the Toni campsite. The part of the tour from the hamlet of Jablenca to the Toni campsite is rather exposed, so some caution is required. 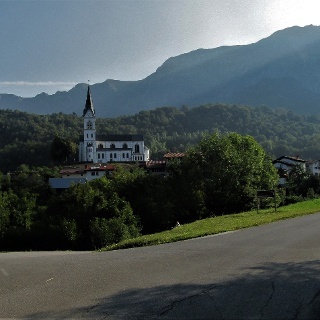 From the campsite, an asphalt road leads to a short but steep uphill section, at the top of which you turn right and cycle via a cart track to the Bovec bypass at the “Devica Marija v Polju” church (Eng. : Church of Virgin Mary in the Field). The tour continues past the tennis courts back to the starting point.